It's the elephant in the room that nobody, especially Elon Musk, wants to talk about but analysts and investors may soon have to face the idea of "teflon" Elon's Tesla stock approaching extremely uncomfortable territory. Not only does a falling stock price put pressure on the company when it eventually goes to sell equity (assuming it can), but it also calls into question the fate of hundreds of millions in stock that Elon Musk has personally borrowed against. Here things are getting uglier by the day: the steady decline in analyst price targets for Tesla keeps inching closer to Musk's inevitable margin call territory, which we believe is around $232. And this morning's downgrade by Morgan Stanley slapped a price target on the company that is just several dollars away from a price that we, and others, believe will trigger Musk's margin call. 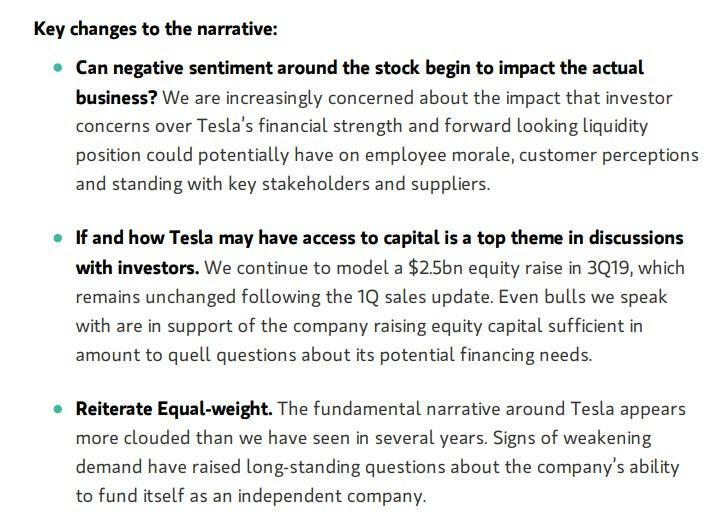 Morgan Stanley's Monday note addressed delivery volume, paltry Model S and X sales and falling revenue while slashing EPS and automotive gross margins targets while calling into question the company's liquidity (or lack thereof) profile. 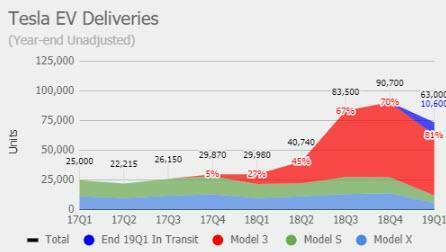 "We expect the 45% YoY decline in 1Q Model S+X volume will largely continue throughout 2019, impacting mix, margin and cash flow. We mark to market our forecasts following disappointing 1Q deliveries and lower our target to $240. Reiterate Equal-weight," Morgan Stanley analyst Adam Jonas said in a note out this morning. In addition, the note addressed what Jonas believes could be "key changes to the narrative" that could send the stock lower, including concerns over the company's financial strength and whether or not the company has access to capital. "...if Musk owed $624.3 million over a year ago and subsequently paid interest on that loan while drawing a minimal salary ($49,920) and continuing his aforementioned luxurious lifestyle while pouring $100 million into his latest distraction, the Boring Company, it seems reasonable to guess that his current loans total approximately $800 million, which means—according to the new proxy—they’d need to be collateralized by $3.2 billion in Tesla shares. As the proxy notes Musk has currently pledged 13,774,897 of his 37,853,041 shares to support those loans, it implies that at a share price below $232.30 (assuming a current balance of $800 million), he’d face either a margin call or the need to post additional shares as collateral. (For some perspective, earlier this month the stock dipped as low as the $244s.)" But for now, Tesla stock has still defied most analysts' pessimistic expectations of it, despite finally breaking below the $300 level. What Morgan Stanley refers to as negative sentiment we just refer to as reality, and the cold hard facts are that if reality ever hits this company, analysts won't even matter at this point: it’s stock price may become a self fulfilling prophecy - in the wrong direction for Elon Musk.